David Wilson It's surprising that Gomez is insecure about her age. It's kind of a letdown to find out there's no official date of birth on Marga Gomez's Wikipedia page. (Supposedly, it once said 1960, but that's been duly redacted.) Not that she's required to have one; apparently, it's permissible to write an entire biographical entry without including the subject's age. And, anyway, a casual reader could glean a lot just by scanning the first paragraph. She cut her teeth in San Francisco's gay comedy clubs during the 1980s, wrote roughly a dozen solo performance pieces in the decades that followed, and proclaims herself the first openly lesbian comedian in American pop culture. Which means that, in at least one sense, she predates 54-year-old gay comic icon Ellen DeGeneres. Gomez looks at least ten years younger than her more-famous counterpart. None of that would seem germane or interesting had Gomez not centered her current solo show around aging. Appropriately titled Not Getting Any Younger, it's a hodgepodge of childhood anecdotes, personal revelations (some of which turn out to be lies), and cranky observations about the modern world. With her Howdy Doody grin and fizzy personality, Gomez can grouse in ways that would be unforgivable coming from any other performer. She can pretend to be an unrepentant Luddite when it comes to social networking, or complain about the permissive nature of parenting these days, or begrudge the Millennial generation for its success. She can even start sentences with codger phrases like "When I was a kid ..." [insert story of excessive corporal punishment and/or character-building childhood trauma here]. That's a hard thing to pull off, unless you're preaching to a group of equally jaded older adults. And, indeed, that seemed to be Gomez's target demographic at The Marsh Berkeley, where she performed last Saturday for a sizeable crowd that she jokingly dubbed "my special Cinco de Mayo audience." She tried that line early on to test the waters before launching into a childhood story about visiting a historical theme park with her garishly attractive, age-defying, then-32-year-old mother. It wasn't until later that she'd hit the more petulant points of the show — like the moment when she complains about how her local Starbucks has become a de-facto children's playpen instead of a workspace — or the sobering parts, when Gomez starts dwelling on mortality. That a fiftyish female comedian would base a ninety-minute show on her anxiety about age shouldn't really surprise anyone. As a culture, we take a prurient interest in age and decay, especially that of the female body. And Gomez, who seems genuinely un-self-conscious in other ways (given that she'll talk about sexuality without compunction), isn't inured to the conventional wisdom that women lose value as they get older. She fixates on the idea of gray hair, despite its conspicuous absence from her own blue-black bob. (Gomez says you'll have to pry a bottle of Clairol from her cold, dead hands to get her to stop using it.) She dramatizes the creak of her knees with a loud, theatrical cracking sound. Through it all, she refuses to divulge her real age. In theory, that's the big "reveal" of the show, but there's actually no reveal — if Gomez does give numbers I wouldn't trust them anyway, since she's obviously prone to fabricate. What's more surprising, perhaps, is that the she has insecurities about her age at all. Gomez attributes it to the difficulty of sustaining a career in show biz, given that so much of her income derives from touring the college circuit. That's understandable, as is her anxiety about having a thirty-year-old, cougar-bait girlfriend. Their age difference is fodder for comedy, too — one of Gomez' best yarns is about being dragged to an "ironic" Nineties-themed house party at her girlfriend's behest. "Like, the Nineties, as in, the decade that just happened," Gomez kvetched to her Berkeley audience. "Not the 1890s." While the handwringing gets tiresome, there are many redeeming parts to Not Getting Any Younger. Chief among them are Gomez' tales about growing up gay in New York City, probably right around the time of the Stonewall Riots (though we'll never know for sure), with parents who didn't easily cotton to the idea of a lesbian daughter. 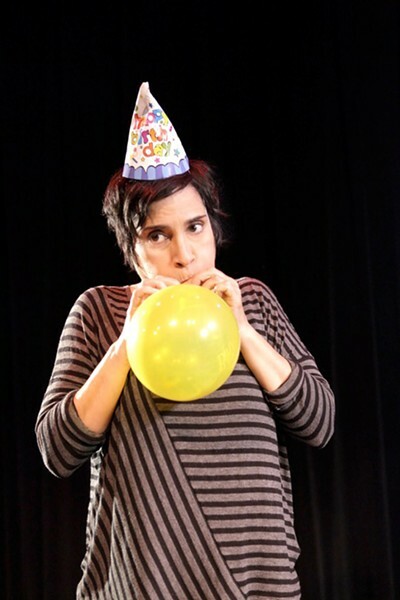 The comedian's loving depictions of her mother include a lot of Spanish-accented scolds, aimed at the ten-year-old tomboy who rallied her dolls for pretend wrestling matches. Most of these memories are lighthearted, with just a hint of some past wound. Granted, that might seem a little trite to a progressive Berkeley audience, insofar as we're all familiar with the main tropes of a lesbian coming-of-age story. Nonetheless, they provide an accurate illustration of Gomez' warm and somewhat fraught mother-daughter relationship. They're apparently not cut from the same cloth, but, in the end, they succumb to the same societal pressures — which remain solidly intact, four decades later. And really, who knew an irreverent tomboy would inherit her mother's angst about getting old?